CLCSF offers various Beginner and Intermediate Adult Sailing courses throughout the sailing season. Anyone 18 and older, regardless of experience, can sign up to learn the basics and/or brush up on their skills in our Z420s and Precision 185s. Start off in one of our 2-3 person boats and learn rigging & derigging, terminology of the boat, basics of sailing and maneuvering, right of way and reading direction on the water, and much more. 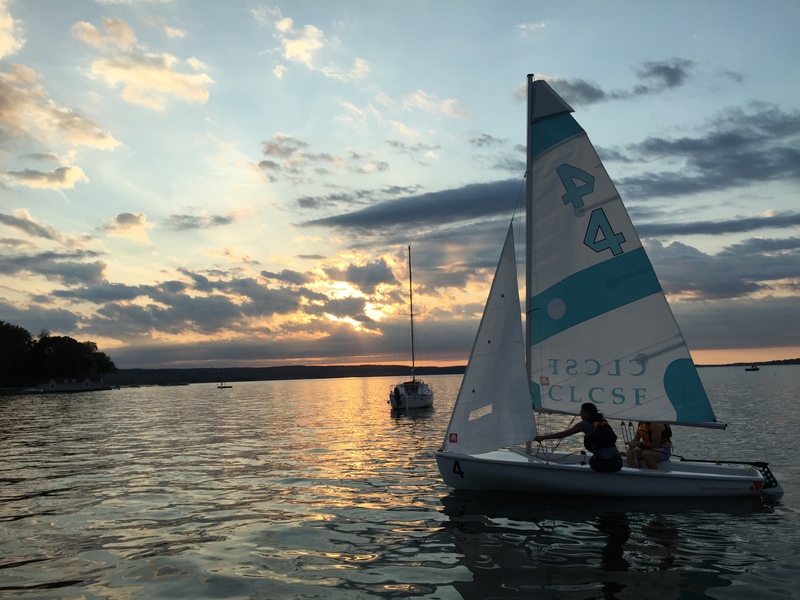 For information on our adult sailing courses and times available in the spring and fall, check out our JCC Course page detailing our non-credit sailing course for adults through Jamestown Community College. In addition to our learning courses, we offer programs for adults with prior sailing experience, however limited, to enjoy the lake at their leisure on one of our boats or join in on fun mini-regattas. Children are welcome to participate along with an adult present. Limited instruction is offered during these programs. As always, life jackets are freely available for all participants. Partnering with Jamestown Community College to bring the community a Non-credit Sailing course for anyone 18 and older who would like to learn sailing in a positive environment consisting of social interaction and fun. 36 hours of instruction, including a combination of classroom and on-the-water instruction. Great program for individuals and couples, parents, or siblings wishing to sail together. This program is for those who have basic sailing abilities. Limited instruction and guidance will be given, with a focus on enjoying time on the water and to improve as much or as little as you want. This program is perfect for anyone wishing to continue sailing after taking our Learn to Sail courses or for those wanting to “dust off those cobwebs”. Select a single night or a package deal and choose from any Tuesday or Thursday nights that fit in with your schedule during the months of September and October. Join in the weekly regattas at Lakewood Beach! Designed for competent sailors of any age, kids to adults, to enjoy and experience the sport of racing. Must be able to right boat in the event of a tip-over. No racing experience necessary. Wearing your favorite sports team jersey, hat, etc. is encouraged. Come out and have some fun with us! Weekly wins will be tallied up at the end of the season with Overall Winners being announced on October 27th! For those looking for a one-on-one experience, we also offer Private Lessons on either our Z420 or Precision 185s for all ages. Private lessons need to be scheduled in advance with at least 24 hours notice. Please call or email to check for available date/times and boat availability if you would like to schedule a private lesson.